They provide an account of how people can perform some mental activity automatically, in a "quick and dirty" fashion. They provide an account of how people, "when willing and able" can perform the same mental activity through "extensive thought". And they provide a description of the conditions which encourage people to perform a process automatically or effortfully. The operation is performed on symbolically represented rules that are structured by language or logic. The operation is learned in a single trial, or over very few trials. It is optional, depending on the capacity and motivation of the person. The person is consciously aware of the steps involved in processing. The operation proceeds by associations, structured by similarity or spatio-temporal contiguity. These associations are learned slowly, over many trials. The operation is automatic, as defined previously. They operate preconsciously (I would say unconsciously), with conscious awareness of their output as a result. Dual-process theories are very popular in cognitive psychology, but they are also extremely popular in social psychology. So popular, in fact, that a number of social psychologists have asserted that social behavior is dominated by automatic processes, to the exclusion of conscious, controlled processes. Indeed, John Bargh and his colleagues have dubbed automatic processing "the New Unconscious". In its early days, cognitive social psychology tacitly focused on deliberate, conscious thought, as represented by such topics as impression formation (person perception), attribution theory, person memory, impression management (strategic self-presentation), and social exchange. Partly as a reaction to what seemed (to some) to be a cold, ultra-rational view of social interaction, some social psychologists have begun to offer theoretical alternatives. For example, some, like Robert Zajonc, have argued that emotional behavior is essentially independent of cognition -- thus, not incidentally, laying the foundation for the emergence of affective neuroscience as a field of inquiry separate from cognitive neuroscience. Others, many others, have argued that automatic processes play a major, perhaps dominant role in social behavior (e.g., Richard Nisbett & Timothy Wilson; Leonard Berkowitz; Patricia Devine; John Bargh; and Daniel Wegner). The current emphasis on automaticity in social behavior is, actually, a revival of a traditional, precognitive position in social psychology which held that social thought and action is constrained by environmental influences -- a situationism exemplified by Stanley Milgram's studies of obedience to authority, and Stanley Schachter's experiments on emotion. "The Automaticity of Everyday Life"
As Skinner argued so pointedly, the more we know about the situational causes of psychological phenomena, the less need we have for postulating internal conscious mediating processes to explain these phenomena. In Bargh's view, most social behavior is preattentive and automatic in nature. It occurs in response to an environmental trigger, in a manner analogous to priming, independent of the person's conscious intentions, beliefs, attitudes, and choices, and also independent of the person's deployment of attention. To the extent that responses to social stimuli are mediated by internal mental representations, these internal mental representations of the situation are constructed automatically, and then "dumped" in consciousness. To illustrate Bargh's position, consider an experiment by Bargh and Pietromonaco (1982), which was presented to subjects as a simple target-detection task. The subjects were simply asked to attend to a computer screen, and press a key whenever a particular target appeared. What they were not told was that a series of words would be presented in the periphery of their vision, or parafoveally. The words were a mix: some of them were related to hostility, while others were neutral. Actually, one group got 0% hostile primes, another 20%, and another 80%. Presentation of each word was followed by a pattern mask that rendered it inaccessible to conscious perception (we'll discuss masking in the lectures on "The Explicit and the Implicit"). The purpose of the parafoveal presentation was to insure that the words were not processed consciously, because they were not the focus of conscious attention. Accordingly, a later recognition test confirmed that the subjects did not remember many of the words. All of this was a set-up, of course, for the main experiment, in which subjects were asked to perform an impression-formation task. They read a story about a fictional character, Donald, who is depicted as engaging in a number of ambiguous behaviors, many of which could be interpreted as hostile. Then they were asked to rate Donald's personality on a series of trait adjectives. The trait ratings were then coded for negativity in general, and for hostility in particular. The subjects in the 0% condition tended to rate Donald as generally negative, but not particularly hostile. But in the 20% condition, and especially in the 80% condition, they rated Donald as hostile as well as just generally unpleasant. 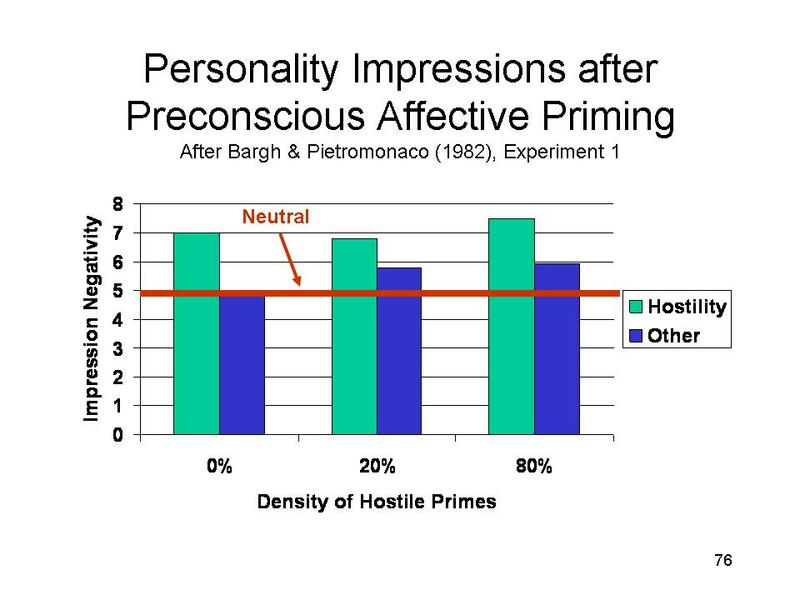 Bargh's interpretation of this study is that the subjects perceived the hostile trait adjectives preconsciously, and that this preconscious processing automatically activated a negative, hostile schema which then guided the interpretation of Donald's ambiguous behaviors. In a later experiment by Bargh et al. (1996), subjects performed a "scrambled sentences" task in which they were given a jumble of words and asked to arrange them into complete sentences. In the Rude condition, many of the words were semantically related to "rudeness", such as aggressively, rude, bother, disturb, and intrude. In the Polite condition, many of the words were semantically related to "politeness", such as respect, honor considerate, appreciate, and patiently. In the Neutral condition, none of the words were related to either rudeness or politeness: examples include exercising, flawlessly, occasionally, rapidly, and gleefully. The purpose of this cover task was to prime the concepts of rudeness and politeness. At the end of the experiment, the subjects emerged from the lab room to find the experimenter engaged in a conversation with another person, who was actually an experimental confederate. The conversation continued for up to 10 minutes, all the while the experimenter assiduously ignored the waiting subject. The main result was that subjects in the Rude condition were more likely to interrupt the experimenter than were subjects in the Polite condition, with subjects in the Neutral condition falling somewhere in between. 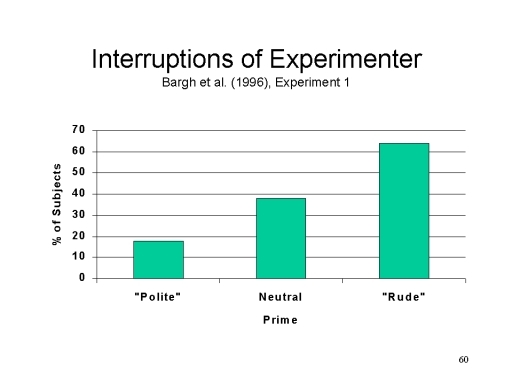 Bargh's interpretation of this experiment is that reading "rude" words automatically primed the subjects to interpret the experimenter's behavior as rude, and thus more likely to behave rudely in turn, interrupting his conversation. For Bargh, automaticity in social behavior begins with a preconscious analysis of the situation. Environmental or social-influence effects on perception an evaluation are independent of conscious processing. In social perception, the inference of personality traits from behavioral observation, stereotyping, and the processing of self-referential information all occur preconsciously. At the perception-behavior interface, a principle of ideomotor action means that thoughts about a particular behavior will automatically lead to the behavior itself. Thus, stereotyped social perceptions will lead to hostility and prejudice. Evaluation effects such as the mere exposure effect, and particularly the "subliminal" mere exposure effect, occur automatically. Attitudes are automatically activated by the mere presence of the corresponding object -- at least if the attitude in question is a strong one. And evaluations can be primed by prior encounters with positively or negatively valenced stimuli. At the evaluation-behavior interface, again, positive or negative evaluations automatically trigger approach or avoidance behavior. Bargh's auto-motive model of social behavior contradicts the traditional model of automatic skill execution, in which we consciously select our intended behaviors, and then those behaviors are automatically executed. This is because Bargh also automates the selection phase, so that environmental stimuli can activate choices preconsciously. In the auto-motive model, goals and motives can be automatically invoked by environmental events -- and, once activated, operate automatically outside conscious awareness and conscious control. Conscious cognition doesn't necessarily mediate emotion, motivation, or behavior. Emotional and motivational processes operate in parallel with, and independently of, cognitive processes. Most cognitive processing is preconscious anyway. So does any role remain for consciousness? Clearly Bargh thinks there's not much. In one paper he evokes the image of "consciousness riding into the sunset". Of course, when cowboys rode off into the sunset, it was after they killed the outlaw and kissed the girl. But that's not Bargh's scenario. In his view, consciousness is not necessary for evaluation, judgment, or behavior. Consciousness may be necessary for the development of preconscious, automatic processes -- which, as in the memory-based models of automaticity, start out as conscious and deliberate and end up automatized through practice. Consciousness may be necessary for behavior in nonroutine situations - -but that just begs the question of how much behavior is actually nonroutine. Consciousness is necessary for the correction of "bad habits". But because conscious awareness logically precedes conscious control, we must become aware of these bad habits before we can correct them. But because bad habits run off automatically, it is not easy to achieve this awareness. And consciousness is necessary for the inhibition of automatic behavior. There is lots of mental processing, all going on automatically, and in parallel, all the time; but people must deal with objects in the real world one at a time. So, as Bargh puts it, consciousness may "connect a parallel mind with a serial world". But for Bargh, the important determinants of behavior operate automatically and unconsciously, independent of phenomenal awareness and free of conscious control. Pressed once to give an estimate, Bargh invoked an old add for Ivory Soap, asserting that social behavior was "99.44% pure" automatic. Copernicus demonstrated that Earth was not the center of the Universe. Darwin demonstrated that Man was just another animal. Freud, for his part, sorrowfully demonstrated that Man is irrational, ruled by unconscious sexual and aggressive impulses of which he has no awareness and over which he has no control. More recent statements by Bargh continue in this vein. In a 2012 paper, he and his colleagues asserted that "automaticity pervades social cognition". "Preconscious automaticity" includes unconscious inputs to conscious processes, and the direct activation of goal pursuit or social behavior. There is also "postconscious automaticity", which is dependent on prior conscious or intentional thought. This same paper seemed to reflect a softening of Bargh's views, in that it allowed for some "interplay" between conscious and unconscious processes. But in a 2013 paper, Huang and Bargh reasserted the "automaticity principle"
The overwhelming influence of the situation on experience, thought, and action. The limits of introspective access to the causes of our behavior. The theoretical power of dual-process models. How a person perceives the world. How a person behaves in response to that perception. Bargh is not alone in this project. Bargh is a leader of the automaticity movement within cognitive psychology, but he has a large number of compatriots and followers, who together comprise a "school" of psychology that I have called The Automaticity Juggernaut. Denise Park, serving as guest editor of a special issue of American Psychologist -- the official journal of the American Psychological Association, and read by almost every experimental and clinical psychologist in the country, if not the world -- wrote an introductory editorial entitled "Behavior -- It's Involuntary", in which she announced the discovery of automaticity as a "fundamental breakthrough" in our understanding of motivation and free will. Timothy Wilson, at the University of Virginia, has long argued that we have limited introspective awareness of our own attitudes and other causes of behavior, because attitudes are largely unconscious. Sandra Blakeslee, one of the best science writers in the business, specializing in psychology, wrote an article for the New York Times Magazine claiming that we humans "are closer to zombies than sentient beings most of the time". Malcolm Gladwell, another best-selling science writer specializing in the social sciences wrote a book, Blink (2005), surveying the evidence for "the new unconscious" and "The Power of Thinking Without Thinking". Ap Dijksterhuis, a Dutch psychologist, has promoted an posed that unconscious thought is actually superior than conscious thought when making complex choices. Daniel Wegner, a psychologist at Harvard, has provocatively proposed that conscious will is an illusion, and plays no causal role in either thought or behavior. Just so he won't be misunderstood, Wegner presents a diagram of the relations between conscious and unconscious thought and action. There is an "actual causal path" from unconscious causes of action and actions. There is an actual causal path from unconscious causes of thought and thoughts. There may be an actual causal path linking unconscious causes of action and unconscious causes of thought, and this path may be bidirectional. But the "apparent causal path" between conscious thoughts and conscious actions is only an apparent, illusory one. The actual determinants of both thought and action are unconscious. Conscious thoughts have nothing to do with conscious action, except by happenstance. The idea was to understand how people experience conscious will when their actions arise from deterministic processes of mind. Rightly perceived by many as an attack on free will, the book received wide attention and wider misinterpretation (American Psychologist, November 2011, p. 670). Given that The Illusion of Conscious Will was perceived by many as an attack on free will, it's not at all clear that there was any misinterpretation. See Wegner's own "Precis of The Illusion of Conscious Will" in Behavioral & Brain Sciences, 2004, 27, 649-692. Link to an extensive analysis of the automaticity juggernaut: Kihlstrom, J.F. (2008). The automaticity juggernaut. In J. Baer, J.C. Kaufman, & R.F. Baumeister (Eds. ), Are We Free? Psychology and Free Will (pp. 155-180). New York: Oxford University Press. It's an interesting argument, that our behavior is so powerfully determined by automatic processes that we have greatly limited conscious awareness and control over our attitudes, beliefs, and the behavior they (apparently) cause. 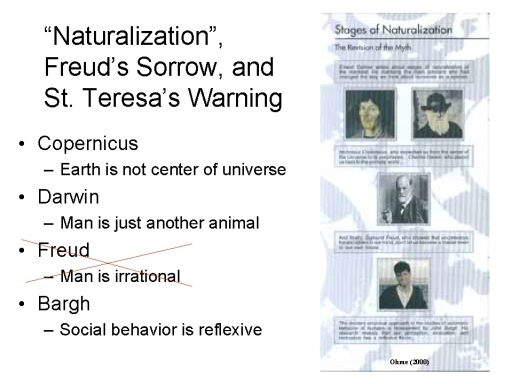 If it were true, then this post-Freudian "naturalization" of human experience, thought, and action would indeed be a cause for sorrow, because it would deprive us of the core of what, for thousands of years (at least, in Western culture, since the Genesis story of Adam and Eve) we have considered human nature -- our ability to know what we are doing, and freely choose one path over another. Note, first of all, that the sorts of experiments performed by Bargh and his colleagues are only demonstration experiments. That is, they show that unconscious, automatic processes play some role in behavior. But that should come as no surprise. Psychologists have long understood that some mental processes are automatic and others are controlled; or, alternately, that every mental task involves some mix of automatic and controlled processes. But the automaticity juggernaut involves a much more dramatic claim: that automaticity so dominates experience, thought, and action that consciousness plays little or no role in the ordinary course of everyday living. To uphold that claim, we need a certain kind of experiment, one that actually compares the strength of automatic and controlled processes against each other. Which is where Jacoby's process-dissociation procedure (PDP) comes in. Although still somewhat controversial, the PDP remains the most widely used means of estimating the relative contributions of automatic and controlled processes in task performance. Although widely used in cognitive psychology, the PDP has been rarely used in social psychology. But when it has been used, the results have been revealing -- and reassuring. Among the earliest applications of the PDP concerned the false fame effect. Jacoby and his colleagues (1989) asked subjects to study a list of non-famous names, such as Sebastian Weisdorf, followed by a memory test. One day later, they were given a long list of names, some clearly famous and others not, and asked simply to judge which of them was the name of a famous person. Among the non-famous names on the list were names from the list that had been memorized 24 hours earlier. The chief finding of the experiment was that the previously studied non-famous names were now judged to be famous. Jacoby argued, reasonably, that the initial study session primed the non-famous names, so that when they appeared on the later fame-judgment task they "rang a bell", and that this increased familiarity was interpreted as evidence of fame. And, of course, the priming was interpreted as automatic in nature. But was it? In a later study, Jennings and Jacoby (1993) applied the PDP to the false fame effect. The experiment was run as before, except that this time there was both an Inclusion and an Exclusion task (we won't get bogged down in the details of how the Method of Opposition was actually implemented). Moreover, the entire study was run under three experimental conditions: first, they compared full attention (no distraction) to divided attention (where the subjects performed a distracting task while they made fame judgments, in order to restrict cognitive resources; second, they repeated the full-attention condition with a group of elderly subjects, to compare with the college students. The results were revealing. In the full-attention condition, which was comparable to the original demonstration of the false fame effect, controlled processing was more influential than unconscious, automatic processing. The role of conscious, controlled processing was diminished in the divided-attention condition (naturally, because of the more limited cognitive resources available), and among the elderly (because of age-related declines in cognitive capacity). But even under these conditions, automatic processing did not dominate conscious processing. It would be more accurate to say simply that the false fame effect was produced by a mix of conscious and unconscious processing. Similar findings were obtained in an experiment on spontaneous trait inferences. Uleman and his colleagues have performed a number of experiments where subjects studied the photographs of strangers, each of which was paired with a simple behavioral description, such as Jane gave a dollar to the beggar). Two days later, they were presented with a larger set of set of photos, including some of the photos studied previously, and asked to make judgments about the personalities of the people depicted. The finding was that targets depicted in the old photos tended to receive trait attributions in line with the behavioral descriptions that had accompanied the photos studied on the first day. For example, subjects tended to describe "Jane" as kind. The interpretation was that, in line with what is called the fundamental attribution error, subjects automatically attribute behavior to a person's personality traits and other internal characteristics, rather than to the situation or some other external factor. So, presentation of the behaviors automatically primed traits, which were then attached to the people depicted in the photos. When the same photo appeared the next day, the subject automatically retrieved the corresponding trait information from memory. But did it? to his credit, Uleman and his colleagues (2005) applied the PDP to their experimental paradigm, running subjects under both Inclusion and Exclusion instructions. In one condition, the subjects made trait judgments immediately after studying the photographs; in other conditions, the trait judgments were delayed by 20 minutes, or 2 days (as in the initial experiment). In the "immediate" condition, in fact, conscious processing proved to be more influential than automatic processing. The role of conscious processing was reduced after a 20-minute or 2-day delay, reflecting the time-related decline of conscious recollection. But even in these conditions, task performance was mediated by a pretty even mix of conscious and unconscious processing. Perhaps the most revealing of these PDP studies is a pair of experiments by Payne and his colleagues concerning the weapon bias. In these experiments, subjects are shown a brief video clip, and they have to judge whether the person in the clip is holding a weapon (a knife or a gun, for example) or a tool (like a wrench or a TV remote). Before performing this task, however, the (white) subjects are shown the face of a black or white person. The finding is that the white subjects are more likely to misidentify tools as guns when they have been primed by a black face. Moreover, they were faster to correctly identify the object as a gun after they had been primed with a black face, and faster to correctly identify the object as a tool after they had been primed with a white face. The interpretation is that the presentation of the faces automatically primed racial stereotypes in these white college students, including the stereotypical association of black people with crime and violence; and that this stereotype automatically biased their weapon judgments. But did it? It depends. In his initial experiment, Payne (2001) applied the MOP in his standard experimental paradigm, in which there was no deadline, and subjects could take their time making their judgments. In this case, controlled, conscious processing proved to be more important than automatic processing. In a later study, Payne and his colleagues imposed a deadline on the subjects, forcing them to make their decision, weapon or tool, within 500 msec of the video. This was done to more closely simulate the situation of a police officer who must make a split-second decision about whether an object in a suspect's hand is a weapon. Under these circumstances, where subjects had to make very rapid decisions, automatic processes dominated; but there was still a healthy amount of controlled processing in the mix. So, the bottom line is that automaticity plays some role in social cognition and behavior, as we would expect -- because automaticity plays some role in everything we do. The relative impact of automaticity is increased under conditions that militate against conscious processing, such as distraction (which consumes attentional resources), long retention intervals (which induce forgetting) or short response windows (which preclude conscious processes from coming into play). And even under ordinary circumstances, there is enough "mindlessness" in the ordinary course of everyday living to convince us that there's something to this automaticity business. But the assertion that "humans are closer to zombies than sentient beings much of the time" (Blakeslee, 2002) is wide of the mark. There's just no evidence to support any such belief. One of the most provocative findings motivating the automaticity juggernaut was reported by Benjamin Libet (1983), a physiologist at UC San Francisco, on the readiness potential, a form of the event-related potential (ERP) recorded in the EEG. In fact, the Libet experiment inspired Wegner's argument that conscious will is an illusion, and that the "actual causal path" goes directly from an unconscious cause of action to the action itself, bypassing conscious thought. Normally, the ERP is measured in response to a stimulus. When averaged over many trials, the EEG produces a series of waves occurring within about 1000 msec of the presentation of the stimulus. Waves occurring during the first 10 msec appear to represent brainstem responses to the stimulus. Waves appearing within 10-100 msec appear to represent sensory processing. Waves appearing within 100-1000 msec appear to represent cognitive processing. The P300 wave, a positive deflection occurring roughly 300 msec after the stimulus, is magnified in response to an unexpected stimulus -- like a unexpected "boop" after a series of "beeps". The N400 wave, a negative deflection occurring roughly 400 msec after the stimulus, is magnified in response to an incongruent stimulus -- such as the word cow in the sentence, I like to take my coffee with cow. In a variant on the ERP paradigm, Kornhuber and Deecke (1965) recorded the EEG before their subjects made simple voluntary movements, such as tapping a key with their index finger. Averaging over many trials, they observed systematic changes in the EEG, beginning approximately 800 msec before the actual movement. They called this ERP the readiness potential (RP). According to a common interpretation, the RP follows the subject's decision to move, as the motor system prepares the movement itself. In a variant on the basic RP experiment, Libet and his colleagues (1983) asked subjects to watch a special clock, whose hands moved full circle very quickly, once every 2.56 seconds. Every time they moved their finger, they were to use the clock to record the precise moment when they decided to initiate the movement. As you can imagine, this isn't easy, but subjects can learn to do it with practice. About 200 msec elapses between the awareness of the wish to act, and the action itself. But the readiness potential begins about 350 msec before the subjects' awareness of the wish. The implication is that even apparently voluntary, spontaneous acts are instigated by an unconscious desire to act, represented by this Type II RP, which precedes the conscious wish. Libet had earlier obtained evidence, again from ERP data, that a stimulus must persist for approximately 500 msec in order to be conscious. Otherwise, it remains conscious. Putting the two findings together, Libet (1983, 1985, 2002, 2005) proposed a "time on" theory of consciousness. Neuronal activities mediate unconscious mental events. Unconscious mental events become conscious only if they persist for an adequate time, which is approximately 500 msec. Behavior -- even apparently conscious, voluntary behavior, is instigated unconsciously. Conscious control exists only as a veto -- that is, a conscious decision to terminate an action that has begun unconsciously. The time between the awareness of the desire to act and the action itself, is very short, approximately 200 msec. If the veto is not exercised in this veto window, then the unconsciously generated action will be completed. Needless to say, the Libet experiment swept the field like a wildfire. At the time, UCSF was a hotbed of Freudian psychoanalysis, and many of them took his findings as evidence that Freud had it right -- that the unconscious wish was father to the conscious thought. Others, like Wegner, took it as evidence that conscious will is an illusion, and that consciousness is epiphenomenal -- that consciousness played no role in ordinary social behavior, and that the reasons we give for doing the things we do are little more than after-the-fact rationalizations. And, needless to say, the Libet experiment was highly controversial -- precisely because it seemed to undermine our common experience that we have free will. And pretty soon, criticisms of the Libet experiment began to pile up. The first important point was that people were able to replicate Libet's own findings in their own laboratories (e.g., Banks & Pockett, 2007). But as they tried to replicate Libet's findings, they began to understand the difficulties with his experimental procedure. There was a tremendous amount of variability in subjects' behavior. So, if the Type II RP began, on average, about 800 msec before the action, the 95% confidence interval around that mean was relatively large -- meaning that the RP might actually occur much earlier. There were some sources of error in the measurements. In determining the onset of the RP (which isn't quite as mechanical as it sounds, and requires a fair degree of judgment). In determining the onset of the conscious wish (which required subjects to track a rapidly rotating object). The upshot of these errors was that the Type II RP might occur closer to the conscious wish than Libet thought it did, but the point remained that, no matter what the variability and error, the best estimate was that the RP still occurred before the conscious wish. Moreover, some commentators cast doubts on the ecological validity of Libet's procedure -- that is, whether the results from his laboratory experiment were generalizable to the real world. It was pointed out that the action in question, tapping a finger, is pretty inconsequential. Certainly it's not as consequential as choosing a college or asking someone to marry you. Or even as consequential as deciding what you're going to eat for dinner. More critically, it was pointed out that, even in the Libet experiment, the really important conscious decisions had already been made before the trial -- the decision to participate in the experiment to begin with, whether (not precisely when) to move one's finger on any particular trial, and the decision to watch the clock. Picking up on this last point, Miller and his colleagues ((2011) have recently explored the possibility of a clock confound in Libet's experiment. Libet assumed that his subjects' movements were truly spontaneous, but there's a sense in which they weren't, because the subjects had to watch the clock while they made their movements. Accordingly, Miller et al. replicated Libet's experiment, in which the subjects were instructed to watch the clock and report their decision time; but they also added a control condition in which the clock was present, but the subjects were instructed to ignore it and made no reports at all -- all they had to do was make spontaneous movements, whenever they felt like it. W hen Miller et al. did what Libet did, they got what Libet got: a "predecisional negative shift" in the EEG -- in other words, the Type II RP. But when the subjects in the control group made their movements without watching the clock, there was no such shift: the EEG was essentially flat until just before they actually made their movement. So, it appears that the predecisional negative shift was an artifact of the attention paid to the clock -- the cognitive effort involved in watching the clock and recording decision time. It does not, after all, indicate the unconscious initiation of ostensibly "voluntary" behavior, as Libet thought it did. In an earlier experiment, Trevena and Miller (2010) had examined the readiness potential under two conditions: deciding to move (Libet's experiment) and deciding not to move. Both are, ostensibly conscious decisions, and according to Libet's theory, the decision not to move entails a conscious veto over the unconscious decision to move. Yet Trevena and Miller observed no differences in the predecisional negative shift. This also undercuts Libet's claim that voluntary movements are initiated unconsciously, and that the conscious "decision" to move is really only an afterthought. So the Libet experiment does not show that conscious will is an illusion. Maybe conscious will is an illusion (though I don't think so), but the Libet experiment is not a demonstration that it is. Unfortunately, Libet died in 2007, so he cannot respond to this new criticism, as he faithfully responded to all the others that accrued from his initial report in 1983 up until his death in 2007. "Although they are thought to be modeling significant acts of will, they are in fact modeling inconsequential movements." "Although it has been shown that these movements are preceded by or are associated with neuronal events, these events cannot be viewed as causes of the experience of free decisions any more than antecedents or correlates of other simultaneously proceeding psychological events." Unfortunately, Papanicolau gives short shrift to the Miller and Trevena study, which showed that Libet's experimental results were wholly an artifact of his method -- as are, frankly, those of all who followed with variants on Libet's procedure. After Miller et al. (2011), all discussion of conceptual flaws in the Libet experiment is beside the point. If you want to write an article like Papanicolau's, either you have to begin with the conceptual critiques, and end with Miller et al. (2011) -- in which case you discover that reading about the conceptual critiques has been a waste of time; or you hvae to begin with Miller et al. (2011) and end with the conceptual critiques -- in which case there's no point in reading the conceptual critiques. The Miller et al. (2011) study is, simply, a discussion-stopper. In a commentary on Papanicolau's article, I pointed out how dependent on Libet's experiment recent discussions (and dismissals) of free will have been, and argued that, by virtue of its fatal methodological flaw, the Libet experiment should simply be laid to rest. Papanicolau concludes -- remember, he himself is a practicing neuroscientist -- "that the question of the freedom of the will may never be fully resolved by empirical investigations of the cerebral correlates of its manifestations". I'm not sure that this is true, and I certainly doubt that most neuroscientists, and perhaps most psychologists and cognitive scientists as well (except perhaps for the Mysterians among us! ), would accept the proposition that there are any limitations to what can be learned through the scientific method. But I do agree that the Libet Experiment doesn't tell us anything about the nature (or existence) of free will. Or, Are We All Zombies After All? Human social behavior is largely automatized. Our conscious percepts, goals, and emotions are largely irrelevant to what we do. Our conscious percepts, goals, and emotions are automatically triggered by preconscious analysis of environmental stimuli. Consciousness is an afterthought, by which we give plausible or acceptable reasons for our behavior. We are all zombies after all -- not, as Daniel Dennett would have it, because zombies are conscious too, but because consciousness really is epiphenomenal, and plays no causal role in our behavior. But all the experimental evidence only shows that automaticity plays a role in social cognition and behavior, and that the extent of its contribution depends on the precise circumstances of task performance. Nowhere is there any evidence that experience, thought, and action are dominated by automatic processes executed unconsciously. And the Miller study makes clear that the Libet experiment, always controversial anyway, is no reason to think that we're zombies after all, or even most of the time. In the final analysis, the widespread embrace of automaticity appears to have more to do with ideology than evidence. So why the enthusiasm for automaticity? Why do some psychologists (and other cognitive scientists) insist that experience, thought, and action occur largely automatically, independent of conscious awareness and conscious control. The first reason, I think, is that consciousness makes people nervous. It's made psychologists nervous ever since Watson. It's hard to understand how conscious mental states could emerge from neural processes, and it's hard to understand how conscious will could have causal powers in a universe consisting of particles in fields of force. That's why psychologists and other cognitive scientists have expressed what Owen Flanagan called conscious shyness. The idea that any process performed consciously could also be performed unconsciously gave support to conscious inessentialism -- the idea that consciousness is not necessary for adaptive behavior. And demonstrations of the role of unconscious automatic processes in experience, thought, and action gave support to epiphenomenalism -- the idea that consciousness plays no role in behavior. T.H. Huxley thought that nonhuman animals had some form of consciousness, but were conscious "brutes" in whose behavior consciousness played no functional role. Huxley appeared not to believe this about humans, but some riders on the automaticity juggernaut seem almost relieved not to have to worry about consciousness anymore. A related reason can be found in the physics envy that infects many psychologists -- the desire to make psychology a "hard science", like physics, instead of the blend of biological and social science that it actually is. Interestingly physics envy was original diagnosed in biology, by Joel Cohen (Science, vol. 172, May 14, 1971). And more recently it has been diagnosed in economics by Andrew Lo, in a draft paper posted to the Internet in 2010. Given that psychology is both a biological and a social science, it's no wonder that psychologists suffer from it -- we get it from both directions! Given the assumption that all we have is the physical world, which is all we appear to have, at least so far as science is concerned, is hard to understand how free will could enter in the closed causal sequence that characterizes the physical world. Automaticity -- in which an environmental stimulus automatically triggers a process that automatically generates a mental state that automatically determines behavior -- is a way to come close to the probabilistic pinball determinism of modern physics, if not the clockwork determinism of the classical Newtonian version. The distinction between clockwork and pinball determinism comes from The Cosmic Code: Quantum Physics as the Language of Nature by Heinz Pagels (1982). But why is it social psychologists, like Bargh, and Wilson, and Wegner, who are so avid in promoting automaticity -- social scientists, not neuroscientists, who ought to understand the complexity of human behavior and the role of consciousness in it? The answer to that question, I fear, comes from an unholy alliance between traditional social psychology and behaviorism. Social psychology was traditionally defined, as by Gordon Allport (1954), as the study of social influence -- its subject matter was taken to be the role of the social situation in determining the individual's experience, thought, and action. That is a position that is perilously close to that of Watsonian and Skinnerian behaviorism, which emphasized the association between environmental stimulus and organismal response, with no mental processing inbetween. It is no accident, I think, that Bargh cites Skinner favorably in some of his most prominent articles. Proponents of automaticity like Bargh do not consider behavior to be caused by the objectively described situation, as Skinner would have had it. Rather, like all cognitive social psychologists, they place emphasis on the person's internal mental representation of the situation, and the cognitive processes by which it is constructed. While it is axiomatic in cognitive social psychology that behavior is a function of the perceived situation, as opposed to the situation as objectively described, Bargh and his confreres argue that the mental representation of the situation is itself constructed automatically and preconsciously. Thus, Bargh and other automaticity theorists are able to maintain a superficial allegiance to cognitivism, while at the same time harkening back to the radical situationism of Skinner, and of earlier, pre-cognitive social psychology, and embracing the conscious inessentialism implicit in the work of Dennett. behaviorism with a cognitive face. One has to wonder: We had a cognitive revolution for this -- to be told that Skinner had it right after all? Reading the social-psychological literature on automaticity, one might almost wonder why we bothered to have a cognitive revolution in the first place. To bring this discussion full circle: To some extent, the "automaticity juggernaut" within contemporary social psychology exemplifies the ambivalence with which the idea of consciousness is held in cognitive psychology and cognitive science (as in Flanagan's conscious shyness). In addition, it seems to reflect a sincere belief, on the part of some social psychologists (including Bargh himself), that a truly scientific explanation of behavior must be deterministic, and leaves no room for anything like conscious will. I end this on a personal note. For more than 20 years, I have been trying to get psychology to take a non-Freudian view of unconscious mental life seriously. To some extent, the general acceptance of the distinction between automatic and controlled processes, represents the success of this work: automatic processes are, after all, unconscious in the strict sense of the term. But it is one thing for cognitive psychology to distinguish between automatic and controlled (unconscious and conscious) mental processes, and it is another thing entirely for some social psychologists to abandon conscious mental processes for a view that mental life and behavior are (almost) entirely automatic and unconscious. Be careful what you wish for: You might just get it! Aesop must have meant it, because essentially the same moral appears in his fable of The Bee and Jupiter, and again in The Old Man and Death. This page last revised 12/17/2014.